The images in this post are of my own work. All include recycled or re-purposed objects, some found on the streets of NY; many include plant materials. Click on any image to enlarge. 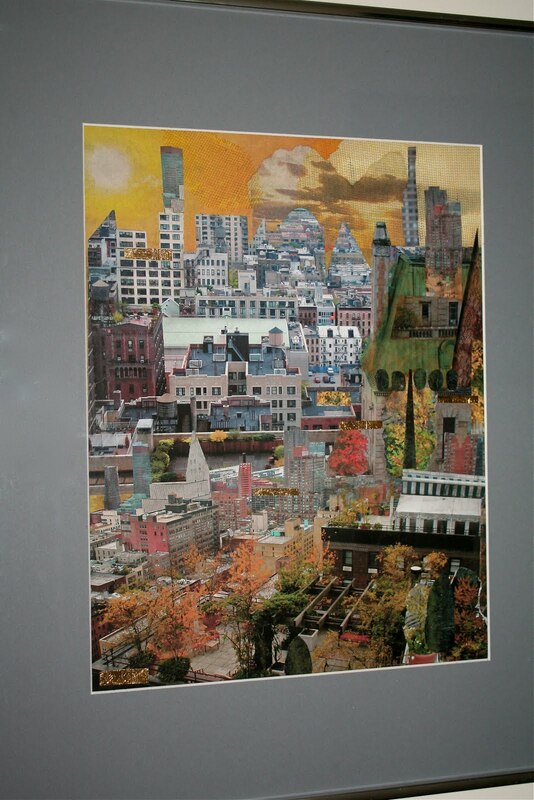 Above: "Water Towers NYC" by Ellen Spector Platt, digital images, painted and pasted paper, pressed Japanese maple and yarrow leaves, glue. The view from my living room window;in this collage I'm greening the rooftops. 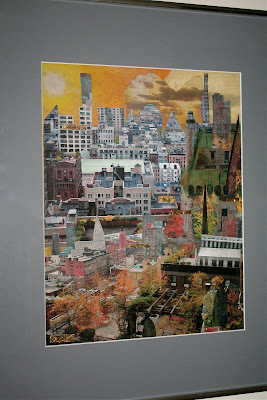 Above: "Westside in Autumn" by Ellen Spector Platt, cut digital images, torn paper, mesh bag, pressed leaves. Here I'm greening the rooftops of the west side in autumn. Above: "Building Bridges", cut digital images, torn paper, watercolor paints, gold pen. Above: "Design/Build"cut blueprints, torn paper, acrylic paints, wood coffee stir sticks, parts from a wine box. The landscape here is made of found,torn green papers. Above: "The Crown Jewels", from the streets of New York City, locust pods, acorn caps, and fir cones; also magnolia leaves, sorghum pieces, paper fasteners, legal seals, newspaper, gold and copper paint, glue. 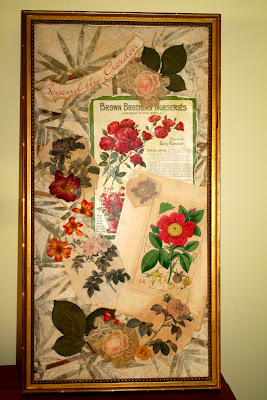 Above: "Grandma Roses", pressed roses and rose leaves, old fabric, old botanical and advertisement, on bamboo paper, paper, paint, glue. Above: "Temple of the Gods", found birch bark, Japanese maple twigs from my garden, cardboard wrapping from egg carton delivered by Fresh Direct, wooden yard-stick give-away, embroidered leaves, paper, paint, glue. 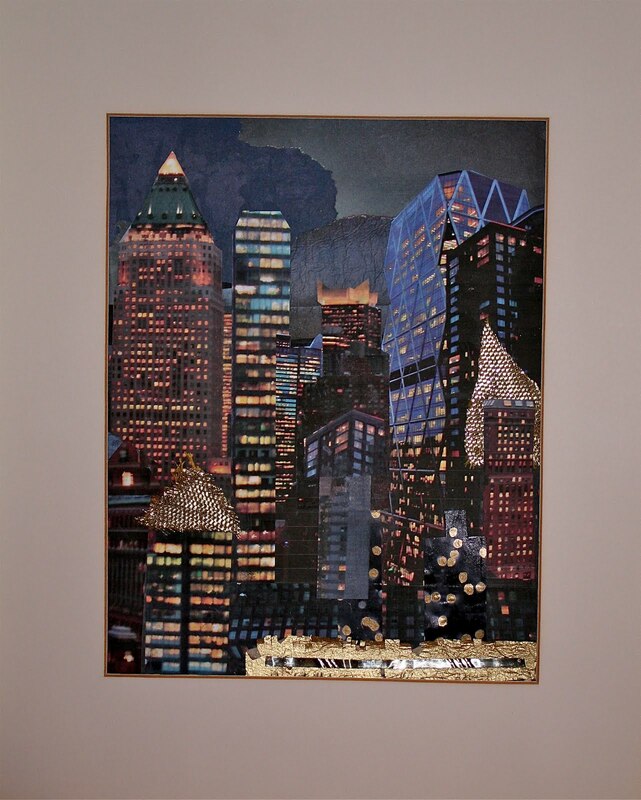 Above: Night on the Town, cut digital images, paper, paint, glue, found metal and fabric. Above:"Grandma's Sewing Box", old buttons, thread, bobbins and other findings, ribbon, name tapes all from my mother's sewing box; papers from a late 19th C. fashion newspaper; cotton boll I grew on a NYC rooftop in a container. Above, "Waterlilies", handpainted paper, cut photos, gold foil, gold wire, brass tacks, piece of file folder. 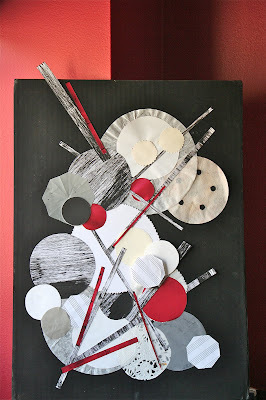 Above: "Black & White & Red All Over", cut and painted recycled papers, coffee filter, sanding disc, paper doily. Above: "Historic Deco District", cut digital images, cut recycled paper, Florida beach sand. Above: "Still Life in Black and White": cut and torn recycled papers, cancelled postage stamps, pressed home-grown elephant ear leaves and flowers of Montauk daisy. This class must have spanned a good length of time - your work is fantastic! :-) Love the first one! AMB said"I can't believe how fabulous your art work is; amazing! I love them all. The"water Towers..", the close up of "The Crown Jewels"; "Grandma Roses"
reminds me of Japanese art; can't decide on favorite---they are all so great and I love your titles."